Green Tree Elementary School, located in Lake St. Louis, Missouri, has been around for 20 years. The school has a great staff of about 50 teachers with 730 K-6th students in the building. This guest post was written by Doug Small, Computer Teacher for Green Tree Elementary School. You can follow the school on Twitter @GreenTreeElem. 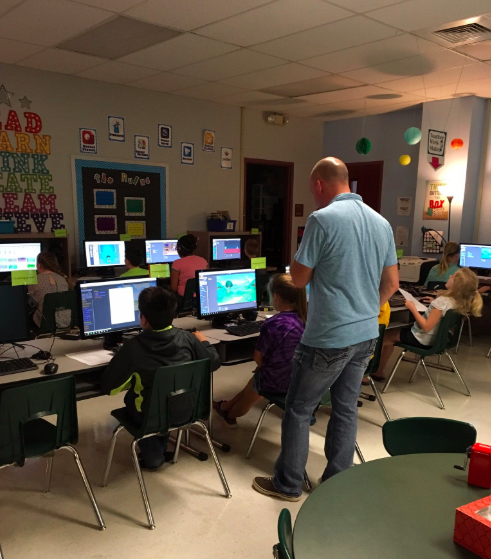 I wanted students to be more engaged in technology, so I started to teach them coding last year. In doing so, they loved it and I wanted to dive further into the curriculum. Our school doesn’t have coding in the curriculum, so I am now implementing it in my everyday teaching to prepare the students for the future. Kids are now more engaged in learning and more successful in critical thinking, problem-solving, and self-discovery. My principal has been amazing and helped me in any way she could in allowing me to share my vision with the students. My building principal has made all the difference. I presented her with a vision of how I wanted to change computer class to more of a technology class where we focus on coding, problem-solving, and critical thinking. So we bought Tynker for coding, then I bought a lot of STEM activities (including Osmos, Makey Makey, 3D Printer, and 3D Pens), to teach students and give them a wide variety of experiences with new innovative technologies. I was able to completely change the scope and experiences that students were receiving in computer class. Green Tree 5th graders loved learning to code with Tynker! My school district and school’s policy toward the computer program has been fantastic and very supportive. This is the first year we are using Tynker in just our building. The whole district is not using it at this point in time, but I am now on the curriculum team to write the K-6th grade curriculum to be used by the whole district. So the goal is to have the whole district using Tynker in the next one, two, or three years. I know that for me, Tynker is contributing to my building a ton, and I hope to continue to use it for a long time to come. I am not the only one using it either – most classroom teachers will be using Tynker for the STEM activities as well.